This chapter presents findings from an ethnographic research conducted in a secondary Muslim faith school for girls in England. The Muslim school is different from madrassas in providing mainstream formal education to pupils with an addition of a few Islamic subjects. The chapter starts with a brief discussion of the socio-cultural context within which Muslim schools have emerged in Britain and the controversies around their existence, which primarily relate to the integration of Muslim minority children in Britain. The chapter then analyses how the girls (11–14 years) are ‘socialized’ through three different types of curriculum i.e. ‘Islamic’, ‘National’ and ‘Islamicised’ used in the studied school. The paper argues that teaching through these forms of curriculum aims to help the young Muslims develop a British Muslim identity which is compatible with their religion and prepare them to integrate in the society. It informs the contested debates around the role of Muslim faith schools and highlights the teaching and learning processes through which the young Muslims are socialized. Such processes are largely ignored in the debates surrounding the education and integration of Muslim minority children in Britain. Ahmed, I. (2004). The education of Muslim children. Available at: http://www.islamfortoday.com/ukschools.htm. Accessed 15 Sept 2006. Coughlan, S. (2005, January 18). I’m just as British as David Bell. What right has he got to say I’m constituting a threat? BBC News. Available at: http://news.bbc.co.uk/1/hi/education/4184319.stm. Accessed 5 Dec 2005. Crabtree, V. (2003). Faith schools and social segregation: Disadvantages of divisive religious behaviour. 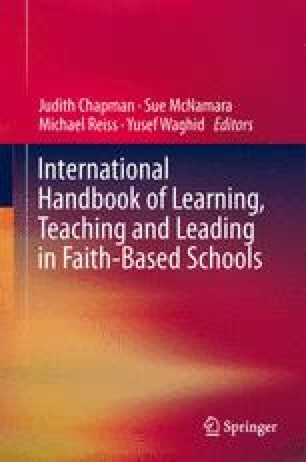 Available at: http://www.vexen.co.uk/religion/faithschools,htm. Accessed 7 Nov 2005. Halpin, T. (2005, January 18). Islamic schools are threat to national identity, says ofsted. The Times. Available at: http://www.timesonline.co.uk/article/0,,2-1445275,00.html. Accessed 5 Dec 2005. HMIE. (2003). http://www.hmie.gov.uk/institute.asp?ins=9047&typ=3. Accessed 20 Sept 2006. ONS (Office for National Statistics). (2001). UK national census 2001: Focus on religion. Available at: http://www.statistics.gov.uk/focuson/religion. Accessed 17 Nov 2006. Smith, M. K. (2000). Curriculum theory and practice. The encyclopedia of informal education. www.infed.org/biblio/b-curric.htm. Accessed 3 Jan 2007.